The claret tasting confirmed my belief that tasting is not a subjective experience; that there are qualities in a wine that tasters find aesthetically pleasing. In fact, I wonder how much subjectivity is present in tasting. Just like some iconic paintings that most viewers find attractive, wines can be appreciated for their combinations of colours, smells and flavours. That is different to the taster liking them, however, as we can appreciate the quality of something without necessarily liking it On Saturday evening, ten people were asked to vote for the their top two wines. Those people had a range of experience in tasting, were young and old and of both sexes. The votes cast had a narrow spread, most chose wines 2, 5 and 6, with wine number 5 (Pontet- Canet) appearing on everyone’s list; 8 people put in in first place. Pontet-Canet and Leoville Barton (5 & 6) were also the most expensive, whilst number 2 (d’Issan) was the third most expensive. Any manufacturer must make their product attractive to ensure sales. They are very aware of their markets and would not invest millions of capital in a market that was so subjective as to make any volume of sales a lottery. Wine makers must also be aware of combinations of techniques and grapes that produce certain aesthetically pleasing effects, hence the blending process being very important. My argument is that the quality required resides in the wine more than (though not wholly) the subjective impression of the taster. As I said above, appreciating is not the same as liking but we can, objectively, recognise a ‘good’ wine – and therefore train ourselves to. 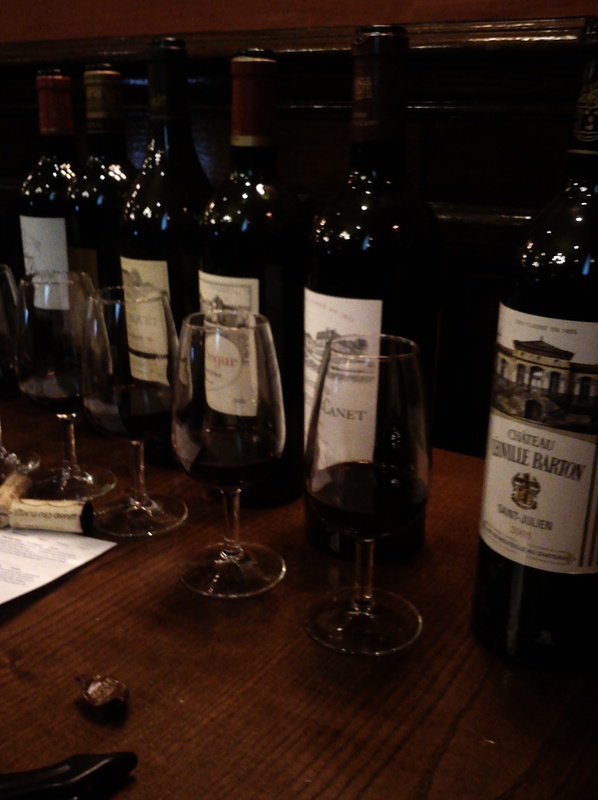 I attended, on Saturday night, courtesy of Birmingham Wine School and Rob Price, a tasting of six 2005 clarets . ’05 has been heralded (rather prematurely, as we are only 15 years in) as the vintage of the century. Hot, but not too hot, summer months with rain at the right time produced well-balanced, firm and rich wines with considerable ageing potential. It was interesting to translate those notes into tangible wines. The top two for me were Paulliac’s Pontet-Canet and St Julien’s Leoville Barton, both of which commanded a retail price of £125 per bottle. I also liked d’Issan, a Margaux – a bit cheaper at £92. So, not everyday drinking wines, but a great opportunity to compare and evaluate the styles. The d’Issan (owned by the Cruse family) was a big, powerful wine, showing blackberry fruit and structured tannins. As it gained oxygen it developed an earthy style, becoming drier compared with the other two wines’ fruit sweetness. It was very popular with my fellow tasters, possibly because of its approachability at a relatively young age. The bio-dynamically produced Pontet Canet had a wonderfully complex nose, all dark fruit and menthol. The palate was smoothed tannins and had loads of restrained power – a horse straining to be let free – yet was still drinking well now. To do so would have been a crime, however; this will go on 20 – 25 years yet. The wine that was way too young to drink now was the Leoville Barton. Slightly menthol on the nose with subtle blackcurrant notes, this wine was obviously still in its shell. The tannins were obvious although some fruit sweetness was present and, as the above, the mood of restrained power was hard to avoid. Another 20 – 25 years await this teenager. The other wines tried were Calon-Segur (St Estephe) – sweeter, not as powerful and will probably be drunk earlier (£80); Forcas-Dupre (Listrac) – okay, a lighter style than the others (£17); and Merlot dominant Monbousquet (St Emilion) – softer tannins, lighter than the others, quite approachable now (£38). It’s the first time I had a chance to consider such a range of clarets over a length of time. I really enjoyed it and would do it again. Another five years, perhaps? No Geoff this Friday and Angie was out in the early evening so I took the opportunity to open a Rioja along with pate and spicy sopressata – definitely not some of her favourite things. 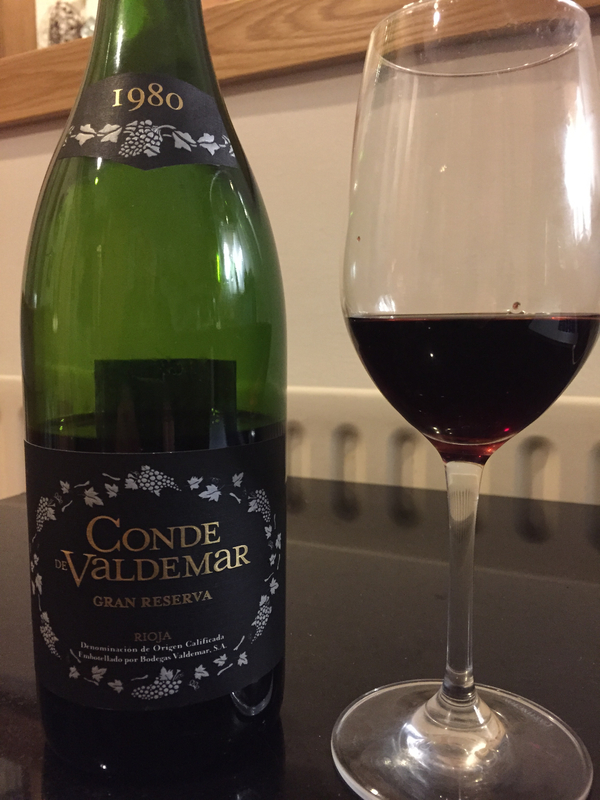 The Conde de Valdemar GR 1980 was purchased from MWW some time ago. They had in a parcel of old wines from this maker, sold onto them by a Spanish restaurateur, I think. About £17, 13%. A fabulous wine, deep colour, not much sign of age, old Rioja nose. 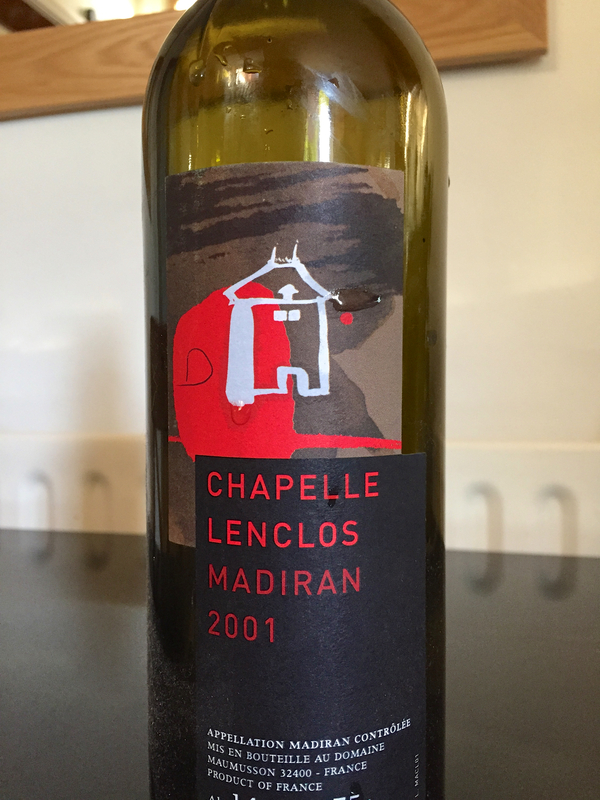 The tannins had gone – leaving a fruit core, slightly sweet, very savoury. Remarkable fresh for a 35 year old wine. 1980 was rated a good vintage (which really means average) but more Gran Reserva was made than usual. A really enjoyable drink. 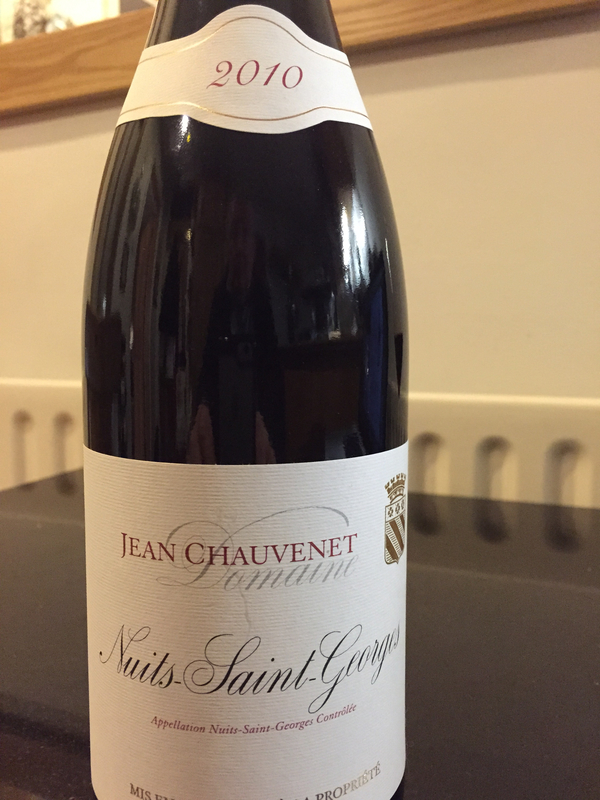 Angie’s favourite grape is pinot so I opened a burgundy for her return (Domaine Jean Chauvenet, Nuits-St-Georges 2010, 13%, bought en primeur from the WS in 2011 for about £24). This was pretty good – four words you didn’t expect to read on the blog, in this context. Much darker than most, decent pinot nose and cherry flavour, well integrated, good mouth feel and ready to drink. An interesting contrast to the Rioja since in some odd way they were similar – both very savoury with lots of fruit. It’s nearly two years since Geoff and I spent a week in Colmar, a leading Alsace wine town. 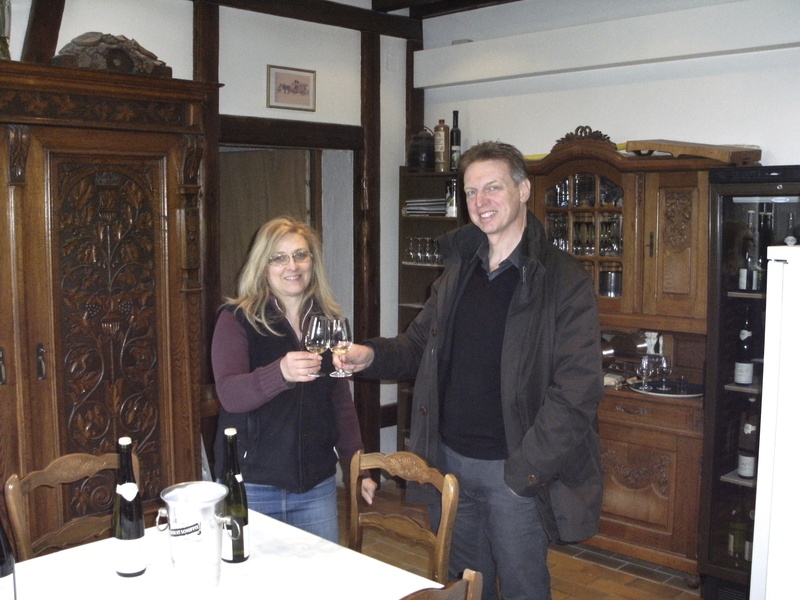 Every day we would drive out to a village to explore, taste and buy, often using the excellent Alsace Wine website as a guide. One day, looking through the pages on the site we realised that there was a very reputable producer within Colmar itself, namely Domaine Schoffit. The opening words on the relevant page were enticement enough, ‘…if I were forced to select one wine to drink the rest of my life, it would very well be Riesling Grand Cru Rangen Clos Saint-Théobald…’ This is the most expensive of the Schoffit wines but still reasonable at around £30. 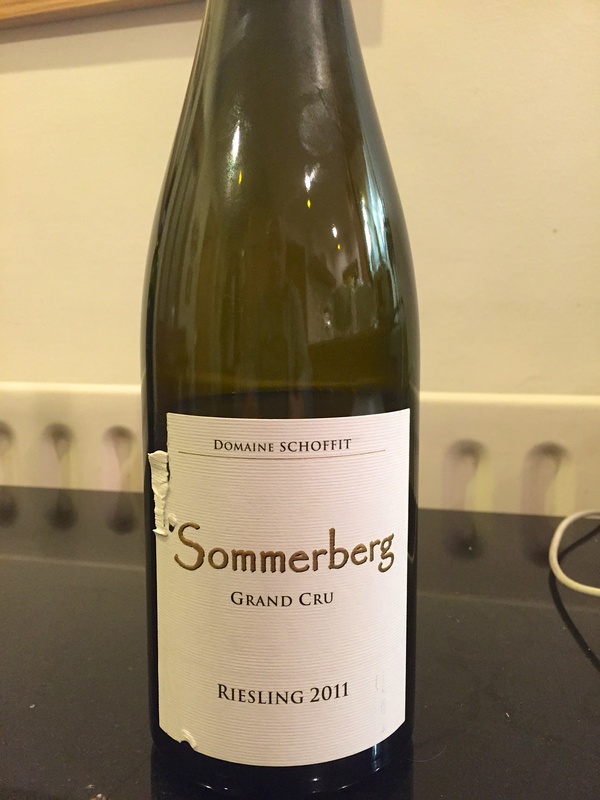 One of the wines purchased was Schoffit’s Sommerberg Riesling 2011 (14%, around £18). No UK supplier that I can find. Sommerberg is a granitic and very steep slope in Niedermorschwihr (home of Boxler, whose wines have also featured here). Classic riesling nose, lots of fruit and with an enticing mixture of acidity, leavened by a hint of sweetness. Very long with great mouth feel. A bargain. Incidentally, although it’s not evident from the photo, the bottle is much heavier and thicker than is usual in Alsace and it just about conforms to the mandatory Alsace shape. At 14% and made from the Tannat grape, this wine would have been a bit of a bruiser in its youth, probably near-undrinkable and lacking in any subtlety. It had still retained that dense black colour and left some windows on the inside of the glass but the nose had developed a fruit sweetness that was inviting. I could also detect a slight oxidation which gave a hint to its declining acidity. There was some acidity but the richness carried through into the palate where it had retained a slight edge of tannin. We’ve both got bottles of Madiran lying in racks. I wonder which decade will suit them best? There we are, I’ve confessed. For me, these are the most consistently interesting and well made wines. 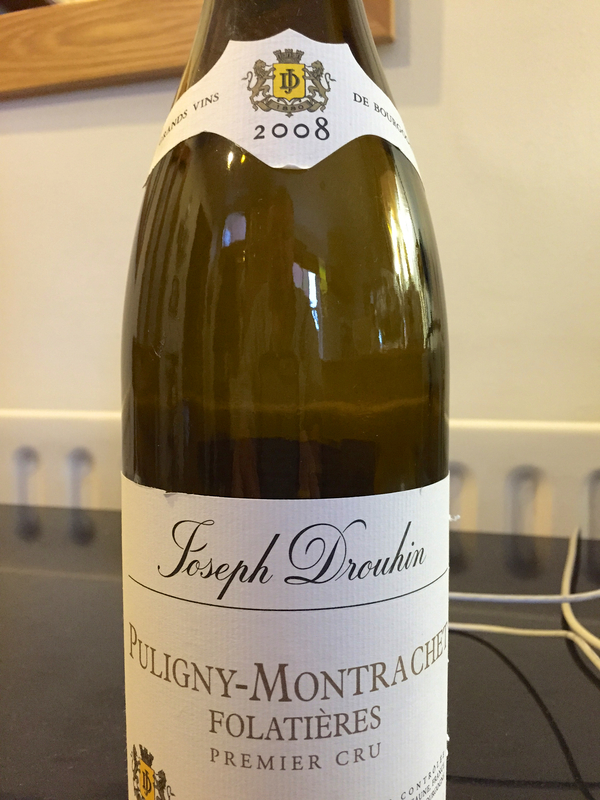 This was no exception – Puligny Montrachet Folatieres Premier cru 2008 by Joseph Drouhin. It was bought from Waitrose who had reduced the wine from £48 to £24 to clear stock about 18 months ago. The really bright clear gold colour shouted quality whilst the aroma of lemons and hazelnuts was so obviously a classy Burgundy that even I (with my recent poor spotting record) got it as southern Cote d’Or. There was a lovely richness to the palate, so well tempered by acidity that it never cloyed. The flavours just kept changing with every mouthful. It was a classy wine, at its best now. I’ve got one left. We’ll let you know. …..was the format of the evening. So two wines, same label, different vintages. Nose – Wine 1: Slight fruit, earthy notes, some rubber (?) Wine 2: Slight dark fruit, not earthy. Verdict – more confirmation of more mature wine being wine 1. Little indication of area. Palate – Wine 1: Bramble fruit, well-made wine, soft, medium length, classy. Wine 2: Richer, spicier, more robust than 1, still bramble fruit but more obvious. As neither wines screamed blackcurrant they were difficult to spot as clarets, although blackberry is also an acknowledged aroma of that grape. 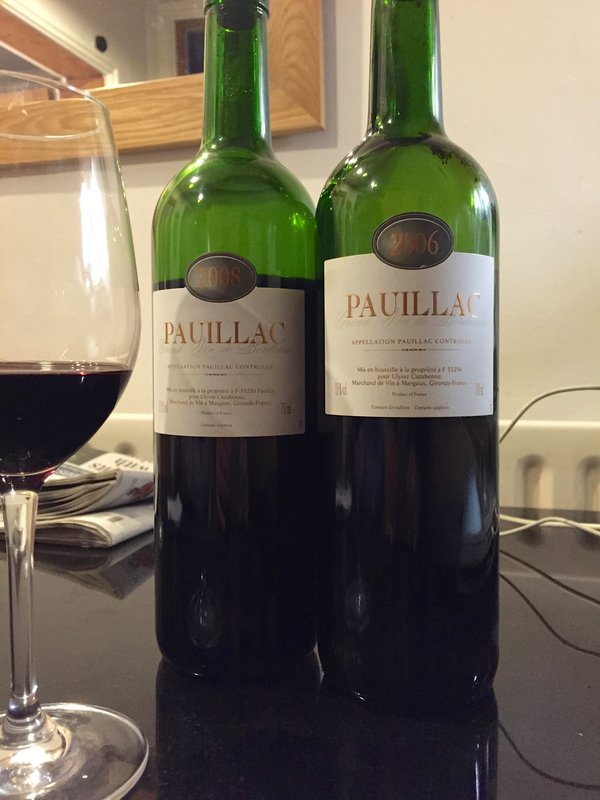 They were both generic AC Paulliacs from the Medoc, wine 1 from 06 and wine 2 ’08. I would have liked to have known the blend, especially how much Cab. Sauv. was used. 2006 seems to have produced more variable wines than 2008 which are regarded as generally fruitier and sweeter. Both were good wines, well made. I’ll let Richard fill in the details.